One of the main risks of uvula excision and UPPP (uvulopalatopharyngoplasty) surgery to treat snoring and obstructive sleep apnea is velopharyngeal insufficiency (VPI). This complication is when the soft palate is not able to adequately lift and close off the back of the nose from the throat. When the VPI is large, food and liquids can come out the nose during swallow and there may be a hyper-nasal speech quality. When the VPI is very small, a patient may report a constant sense of phlegm or mucus behind the soft palate and even up in the back of the nose that exacerbates with talking and swallowing. 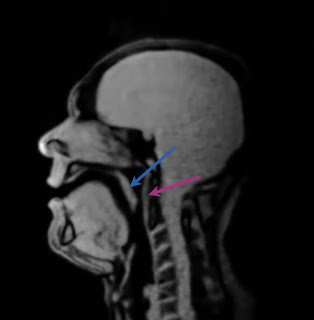 If you look at Image 1 obtained by real-time MRI scan (mid-sagittal section), the blue arrow points to the soft palate and the red arrow is the back wall of the nose/throat. With normal nasal breathing, the soft palate is in a down position allowing a communication between the nasal cavity and throat thereby allowing air breathed in through the nose to pass down into the throat. However, when eating and talking, the soft palate will lift up and close off this passage between the soft palate and back wall. You can see this in Image 2. 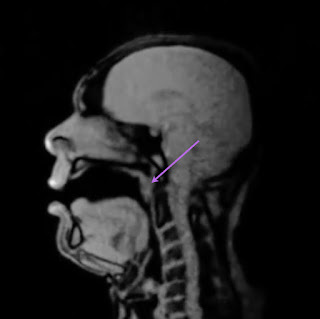 The purple arrow points to where the soft palate has closed up against the back wall preventing any air (or food/liquids) from getting up into the nose. Image 2: Normal closed position. When UPPP or uvula excision surgery is performed, care must be taken to NOT remove too much palate tissue otherwise the patient may not be able to lift the soft palate high and back far enough to close up against the back wall. In Image 3, you can see what happens when the patient is unable to close this area off when too much uvula/palate was excised. 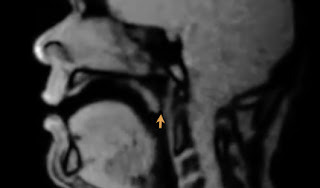 The orange arrow points to a persistent opening between the elevated palate and back wall. This condition is known as velopharygeal insufficiency (VPI). Image 3: Orange arrow pointing to VPI during attempted plosive and sibilant sounds. In this situation, food, liquids, mucus can be forced up behind the soft palate with swallowing/talking. If this opening is particularly large, food/liquids can even come out the nose. A hyper-nasal speech quality is also present. Occasionally, a "partial" VPI may occur whereby the soft palate does technically close off against the back wall, but only in the top aspect leaving the bottom part of the soft palate still separated from the back wall. In Image 4, you can see this "partial" VPI. 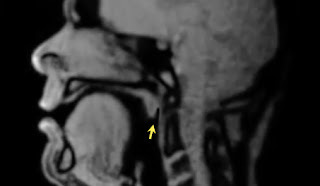 The yellow arrow points to this persistent separation between the soft palate and back wall. Image 4: Yellow arrow pointing to "partial" VPI during attempted plosive and sibilant sounds. With "partial" VPI, the main complaint is constant phlegm sensation behind the soft palate exacerbated with swallowing and talking. This occurs because the saliva in the mouth gets forced up into the "pocket" behind the soft palate created by the partial soft palate closure. In order to correct VPI whether partial or not, one has to close off any potential opening between the soft palate and back wall. If the VPI is small, injection of filler agents like fat, collagen, hydroxyapatite can be performed into the back wall bringing it forward towards the soft palate so that the soft palate can now seal up against the back wall. If the VPI is large, more aggressive surgery is required whether it be a soft palate lengthening procedure (best performed by cleft palate surgeons) or inserting graft material into the back wall. Nasal endoscopy can certainly be performed to evaluate for VPI, but keep in mind it can only assess closure on the top nasal aspect for closure... not on the bottom aspect as seen in Image 4. Some examples of VPI seen on nasal endoscopy can be seen here. 1.5 Tesla or better magnet with a gated fast spoiled gradient echo protocol using the following imaging parameters: field of view, 24-32cm; phase field of view, 0.75 to 1.0; matrix, 256 x 192; time to repeat, 8 ms; time to echo, 4 ms; bandwidth, 41.25 kHz; view per segment, 6; and 30 phases. At least in Northern Virginia, the University of Virginia is able to perform this specialized MRI scan. The order typically needs to be written as "Dynamic MRI of Neck without Contrast to evaluate for Velopharyngeal Insufficiency." A new method for the study of velopharyngeal function using gated magnetic resonance imaging. Plast Reconstr Surg. 2002 Feb;109(2):472-81. Evaluation of velopharyngeal insufficiency with magnetic resonance imaging and nasoendoscopy. Ann Plast Surg. 2000 Jan;44(1):8-13.